Riverside Pumping Station occupies the east end of a much larger parcel of land. 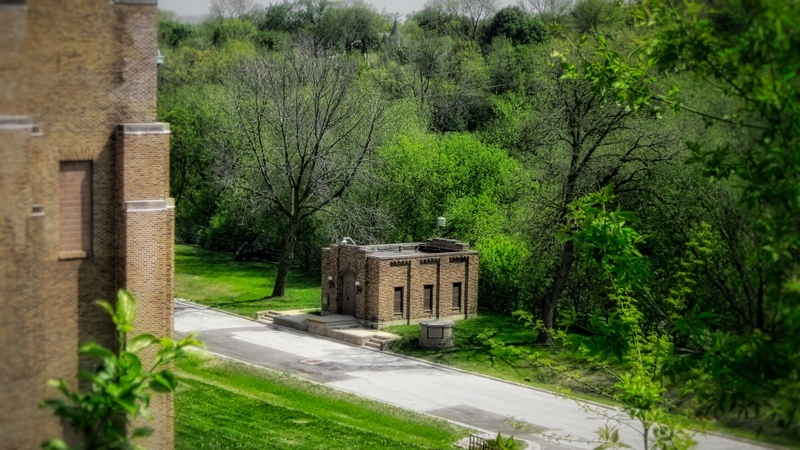 The part not needed by the Water Works became Pumping Station Park and now is maintained by Milwaukee Public Schools. Because city dollars had been used to purchase the land, lawmakers were reluctant to allow it to become a Milwaukee County-owned park. Milwaukee′s water supply has been drawn from Lake Michigan since 1874. 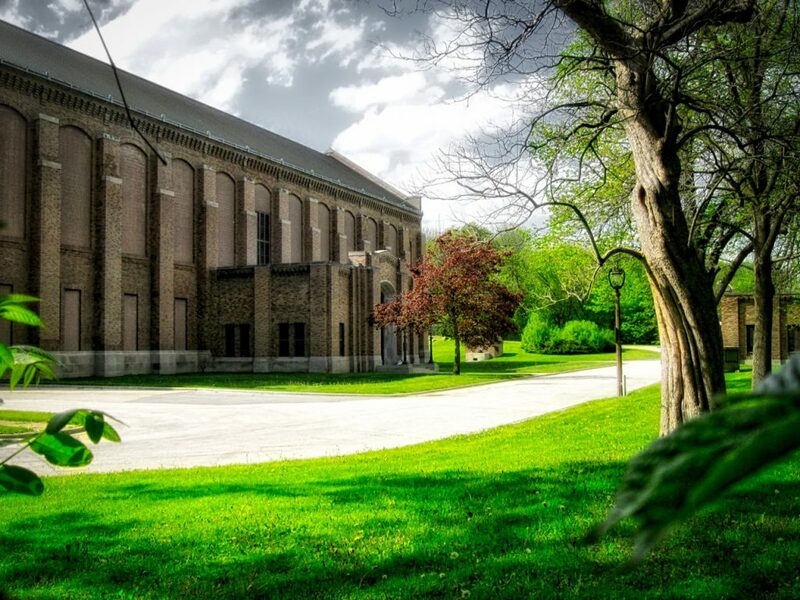 The North Point Pumping Station was built at the foot of North Avenue on the lake shore to pull water from a tunnel extending 2,100 feet out into the lake. In 1895, a second, longer intake was built, a project marred by an accident that killed 14 tunnel workers. A decade later, an entirely new intake was under construction, 12-feet in diameter and stretching 6,553 feet into the lake. In 1921, work on the Riverside Pumping Station started with the construction of a floodwall, built two feet higher than the maximum recorded flood level. At the same time, a nine-foot-diameter, 7,000-foot-long tunnel was excavated from the lakefront to the new station. A fourth pump, rated at 25 million gallons per day, was added in 1927, along with three additional boilers. The following year, a 40 million gallon per day steam turbine centrifugal pump entered service, and the city announced it had all the capacity it needed to meet the demand in the foreseeable future. The utility rushed 1,000 sandbags to the station but they were not needed. Gradually, over the next few days, the river subsided. Twelve years later, the station did flood. On the night of July 27, 1949, a torrential cloudburst sent a surge of stormwater down the steep river bluff, bursting through the plant′s basement windows “like so many Niagara falls,” night shift workers told the Milwaukee Journal. I really appreciate how thoroughly you cover these stories. It gives me new stuff to talk about with my mom who grew up in this neighborhood. Fascinating article. The video gives you a real feel for what Milwaukee’s massive machinery would have been like. Nicely done, Carl! Thanks for linking the North Point article. The complexity of the operation is amazing. Speaking of lost neighborhoods, I remember houses jutting out into the water on the east side of the Milwaukee River. Their addresses were an up hill hike to Cambridge. I looked in the city directories and there were listing for that stretch as late as the 60’s. Also, Carl Sandburg was said to have lived near the river where the street car turned around, Oakland/ Edgewood? Thanks for the article…. I didn’t know about Carl Sandburg living near the river! Now you’ve got me wondering where that could have been! There is a plaque on Sandburg Hall at UWM, referring to a house in the 3300 block of Cambridge Av. It was called the “Palace”in the day and some operators lost fingers, wiping down the oily pumps. For years MWW kept records, photos and anything that might have value in the upper part in large room. Hugh building, tall to ceiling to house the three story steam pumps.